It has been a WHILE, I know. I never meant to be away for so long! It seems since my last post that only a few days has passed....the holidays and post market blitz were on! If I wasn't filling orders, I was decorating, and if I wasn't decorating, I was Christmas shopping, and if I was doing all of that, I was entertaining and cooking! It is time for things to get back into a routine now that 2009 has arrived. My goal is to get back on the "regular posting" routine. It just seems difficult to find time to get it crammed in somewhere, but if I can commit to once a week, I hope that it will eventually become a habit (fingers crossed!). There is a lot I would like to share with you this year, mainly techniques and tips that I have picked up along the way that makes my sewing life easier, and I would love to make yours easier as well. Of course, as I create new designs, I will let you in on the occasional sneak peek. I am getting ready to plunge into book writing. I talk with my editor tomorrow to iron out some details, then I will be busy at the computer and sewing machine creating all the goodies that you will get to enjoy in 2010! It will be exciting to see it all come together over the coming months and my hope is that I will be able to give you a glimpse into that process as well as a peek at those designs as well. Let's see, I left off last time showing you how the booth at fall market in Houston went together. I never did show you the outfits I wore on each day, nor did I show you some close-ups of other stuff that I had in the booth. Below are some photos from the show.....gosh, it seems like a long time ago now! I have already put in my paperwork for the next show, which is in Pittsburgh, May 15-17. I have the designs that I will do dancing in my brain, soon to be into the computer and hopefully in fabric before too long. 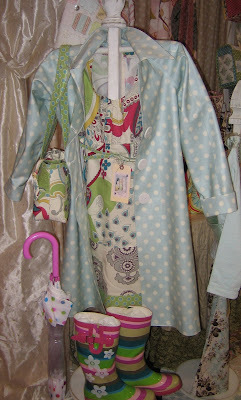 I do want to post that there is a great set of photos for the new Sophia Trench Coat over at A Joyful Soul Fabrics' blog. Joy has sewn this coat and there are pictures of her modeling it....thanks, Joy for your kind words and may I say that you look smashing! Fab New Pillow for a Fab New Mag!